Working with wigs can be very challenging; the industry itself is very complex, techniques and variation are vast and as each individual we see is so unique, our wigs have to be too. No clients lives are the same, so why should our wigs be? Here at Kitui Hair Design, we love challenging ourselves and constantly aim to be the best in the industry. We strive to train and learn and constantly improve. When the opportunity arose to visit one of our main suppliers and further our wig knowledge more, we jumped at the chance. The next thing we knew we were up at the crack of dawn boarding a blurry-eyed flight from Newcastle International Airport. After the usual parade through checkin and customs, sampling as much Duty Free Perfume as possible, we boarded our 3h 25m flight to the central German city of Frankfurt. A quick nap and several coffees later and we arrived at our destination! A quick transfer to the hotel to freshen up and we were straight off to the Ellen Wille HQ. We couldn’t contain our excitement! When we got to the flagship store we were greeted at reception, where we met some of the other candidates attending the training conference. 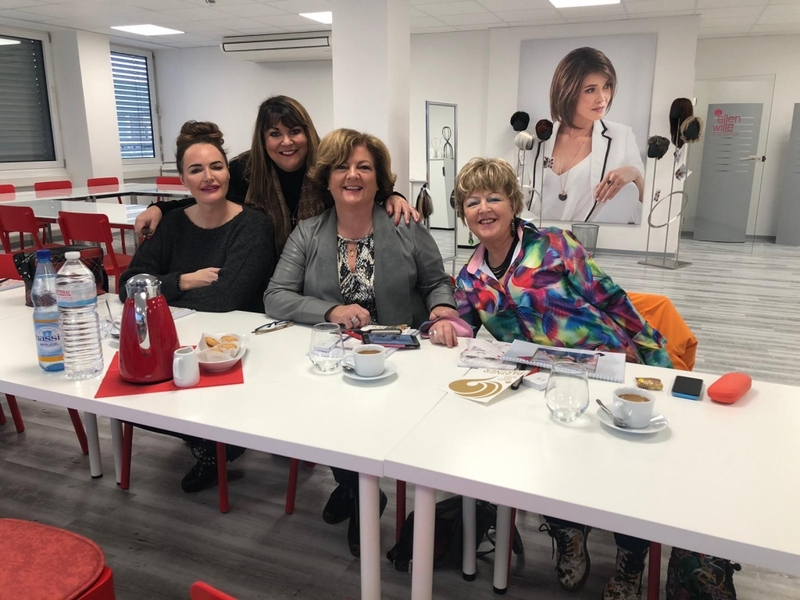 This was certainly an interesting opportunity to meet other like-minded individuals, all of whom had the same mission as ourselves – to collectively improve the wig industry. The store itself was very extremely modern with the most beautiful beige and gold décor interior. We weren’t sure if we expected any less from a company that has achieved so much for industry and the people that are part of it, but it was breathtaking none the less! After enjoying the brief opportunity to meet everyone, we all met Ellen and the training day began. 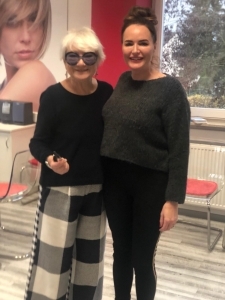 If you didn’t know, Ellen Wille is the founder of Europe’s No.1 wig brand, Ellen Wille – The Hair Company. She leads the way in providing companies like ours with high-quality, sophisticated wigs, hairpieces and headwear. Sporting a particularly glamorous pair of sunglasses, Ellen greeted us, alongside almost all of her 120 staff. She started by talking about her rise within the industry before going on to talk about her personal involvement with the company. We found out how much she was actively involved in wig creation, design and finalisation. Each and every of her wigs are handmade, before then being hand coloured by her team of dedicated specialists. This not only gives the wigs the most natural looking effect but it also helps to ensure that each one passes stringent quality checks. Ellen has made it clear that she would never allow the sale of a wig if it had not reached her exacting standards and she personally had given the wig the go ahead to leave the centre. The morning tour and training lasted a few hours and we also got the chance to have a look at some specialist techniques before lunch was called. Again, like everything else, lunch was certainly not a disappointment. We were served steak and champagne and Ellen joined us to listen and hear about each of our own salon ventures. Every day seemed like a celebration here! 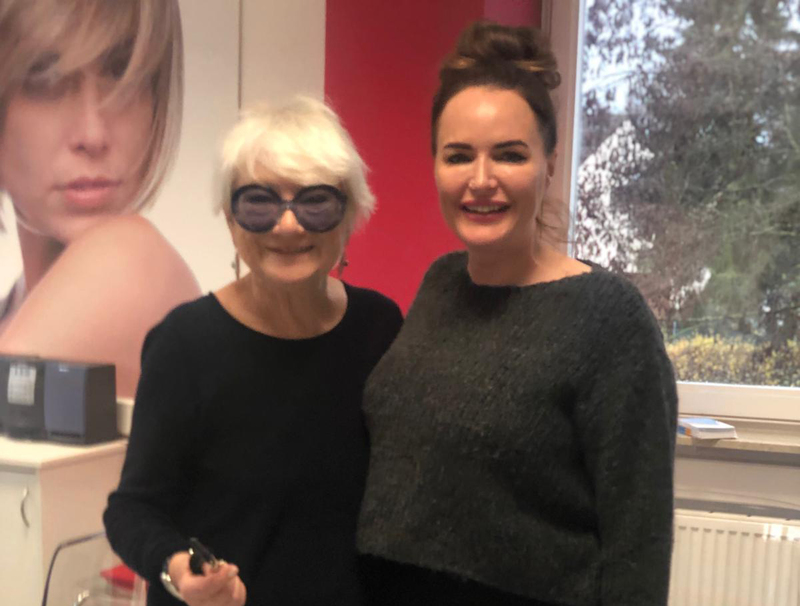 wear” we were delighted to be shown how go the extra mile (as we always do), demonstrating how to style wigs for different occasions and each clients individual needs. The day was over quicker than we would have liked it and Ellen kindly posed for photos, before we all said our goodbyes. 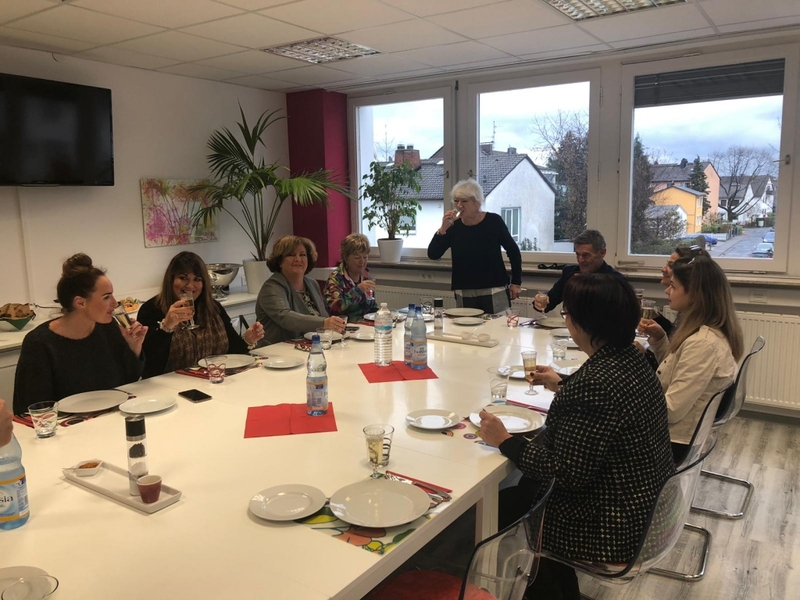 Our first international trip to Frankfurt was certainly a success and we have come back with a lot of valuable knowledge which to impart to others and add to the repertoire at the Wonderful Wig Company. Maybe one day we’ll have our Hair Centre and we’ll be the ones serving steak and champagne to our guests. But for now, our steak and champagne comes in the form of our hard work and the feeling we get delivering the highest quality wigs (not to mention the service) within the North East of England.